Samford University’s Howard College of Arts and Sciences welcomed neuropathologist Ann McKee, M.D., for its 2013 J. Roderick Davis Lecture Oct. 10. Already well known for her and her colleagues’ research on chronic traumatic encephalopathy (CTE,) McKee found herself prominently featured in a Sports Illustrated article and in the Frontline documentary film “League of Denial” earlier that week. Some in the audience might have been surprised, then, to hear her say that “it’s always difficult for me to talk about this disease”. McKee is Professor of Neurology and Pathology at VA Boston HealthCare System and Boston University School of Medicine. 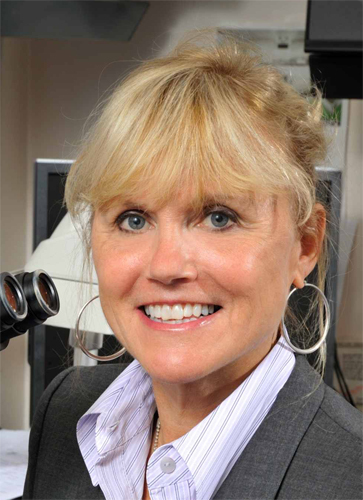 She is also Co-Director of the Center for the Study of Traumatic Encephalopathy, Director of the VISN-1 Neuropathology Laboratory for the New England VA Medical Centers and Director of Brain Banks for the Alzheimer Disease Center and Framingham Heart Study. She is more widely know for her service on the Medical Advisory Board for the Sports Legacy Institute and the Mackey White Traumatic Brain Injury Committee for the National Football League (NFL) Players' Association. Expertise is not the problem. The difficulty is that what McKee has seen and what she has to say about it is so very tragic. McKee and her fellow researchers have demonstrated that some people who have suffered repeated brain trauma—concussions and even subconcussions– are on a track to physical and mental ruin. “The trauma usually is experienced early in life, in the teens and twenties, and people develop symptoms years later, often after they retire from the sports,” she explained. “Once they develop the symptoms those symptoms progress, and as long as the person lives the symptoms get worse. It’s usually a long, steady decline.” The symptoms– including aggression, irritability, cognitive impairment, disinhibition, impulsivity, depression and memory loss–“are the manifestations of a structural disease of their brain,” McKee said. “This is not just NFL players,” McKee said of the growing evidence that football is a prolific source of brain trauma that in some cases leads to CTE. “We are seeing these changes in college-level players and we are also seeing these changes in high school-level players,” she said. The development of CTE “appears to depend on duration of exposure to the sport, as well as a lot of things about innate susceptibility that we don’t quite understand at this point,” McKee said. ‘My mission is to tell you the stories of these individuals and make all of you more aware that things can go wrong,” McKee said before introducing some of the subjects of her work–athletic young men, typically shown in the uniforms of the sport they, and McKee, love. McKee alternated those player portraits with post-mortem slides of their damaged brains. She knows their stories well, knew some of them personally, and knows many more who are still suffering. She related the story of Eric Pelly, age 18, a high school football player who died suddenly 10 days after his fourth concussion, and whose brain already held the lesions that are early signs of CTE. “This is the destruction of brain tissue even before the brain is finished developing,” McKee said. She told of Nathan Stiles, age 17, who did everything “right” after a concussion, staying out of the game for three weeks until cleared by a physician. Stiles returned to the field, suffered a routine hit, “walked over to the bench, collapsed and died,” McKee said. She explained the phenomenon of second impact syndrome, in which new trauma on top of an unrecovered earlier concussion causes rapid brain swelling and sudden death. Stiles’ brain, too, held early signs of CTE, as did the brain of college football player Owen Thomas, who killed himself at 21, having never reported a single concussion. Joseph Chemach’s brain also held “all the features of CTE,” though he played only high school football. By 19 he was becoming erratic in ways that corresponded to the destruction of his brain. He killed himself at 25. “He had this malignant combination of depression, impulsivity and disinhibition, and that’s what underlies all the suicides with this level of disease,” McKee said. NFL veteran Dave Duerson killed himself, too, after suffering the cognition problems, aggression and impaired judgment characteristic of CTE. Apparently suspecting the cause of the problem, he texted his family to ask that they donate his brain to the NFL brain bank, then shot himself in the chest. The case of former college player Ron Perryman points to a new area of concern. McKee and her colleagues proposed in a 2010 paper that CTE might be associated with a motor neuron disease much like Amyotrophic Lateral Sclerosis (ALS or Lou Gehrig’s Disease). It was an intensely controversial finding, eventually supported by a U.S. Centers for Disease Control study that found markedly higher incidence of dementia (3x) and ALS (4x) among players who spent more than five seasons in the NFL. Perryman, who played football staring at age 8 and reported 10-12 concussions, was diagnosed with ALS at age 38. He contacted McKee and her colleagues in the hope of furthering their research. At age 40, knowing that his death was imminent, he called McKee from his farewell party and offered his brain for study. He died shortly afterward, and his brain showed advanced CTE and motor neuron disease. Another player, NFL veteran Kevin Turner, has approached the researchers with a diagnosis of ALS and symptoms characteristic of CTE. “The question is, does Kevin Turner have ALS, or does he actually have CTE with motor neuron disease,” McKee said. Researchers can’t answer that question while Turner lives, and that is one of the frustrations of the work. CTE “destroys families,” McKee said, because the personality and behavioral changes can be so shocking and dangerous. “Just to know that they actually have a disease…is a huge comfort to people,” she said. Diagnosis during life also might offer hope for treatment. “If we can’t measure it and monitor it, we can’t develop a therapy for it,” McKee said. “We’re at a very strange time,” McKee said. “We’ve identified the problem but we don’t have very many answers.” Among other things, she said, researchers can’t yet quantify the risk of play in a given sport or say how common CTE is. They lack an easy way to diagnose subconcussion and concussion, and don’t fully understand the relationship between that trauma and CTE. They need animal models to help them understand and treat the disease. They need to understand possible genetic risks for the illness. They need funding for all that research.